Sometimes people just blow you away. And this is exactly what just happened to me when I had the privilege to meet Justice Sonia Sotomayor, who came to speak at the university where I teach. Although I had read her memoir, My Beloved World (2013), nothing had prepared me for the experience of listening to the well of wisdom that she became in front of our very eyes. I had never met a Supreme Court Justice before, but I assumed that the interaction with the audience would be tempered by formalities, protocol, and the social distance that tends to separate people of her status from the rest of us. I couldn't have been more wrong. She walked around the auditorium and got her picture taken with every student posing a question while brilliantly and convincingly answering difficult questions. Her words were electrifying and her message inspirational. In these difficult times, when U.S. Latino/as have become scapegoats and are being blamed for the ills that plague U.S. society, lets remember that we have great role models who are challenging those negative stereotypes and providing a road map for future generations. Here is a list of some of the most powerful quotes I was able to capture in writing over the course of her visit that can be empowering especially for young Latino/as, but also young minorities and non-minorities as well. Her message was clear, students need to discover what they're passionate about and learn about it. Ask yourself "What is it that you really want to do in this world? The college years are a precious time of growth, so students should take advantage by: taking courses on topics you don't know anything about; befriending people who have different backgrounds and learning their stories; sitting at different clubs' meetings and learn from their conversations; getting out of your comfort zone; studying what you love; informing yourself in order to become a better person. In this current climate, when history books in Texas have been rewritten to provide a more sanitized version of the past, and when Mexican American Studies have been under attack in Arizona and elsewhere, her message becomes a plea to learn about one's own history and about groups that are usually left out of history textbooks. "You make choices about the kind of person you want to be"
When asked by a student how to choose between a more lucrative career that might not be personally fulfilling or a less lucrative job that might give him more personal satisfaction, she reminded the group that "No job is worth your conscience. As long as you're being true to yourself and always live by the motto of "Do what's right," success and happiness will follow. This is an empowering message because she partly geared it to Latino/a students who are facing or will face stereotypes and prejudices in life. Part of the message was not to let others dictate what you can or should be. You make those decisions. "Be a voice for change"
No matter where we are in life, we always have the possibility to "be a voice for change." Justice Sotomayor emphasized this point especially to Latino/a students in the audience. She shared that she has always tried to put herself in positions where she, as a Puerto Rican and Latina woman, can contribute to positive change in society. While the task my seem daunting, she reminded them that "you can't change the world in big ways, but you can change it in small steps." What can Latino youth do to help their communities? "The greater obstacle to success is the lack of knowledge of what's available"
This comment came in response to a Latino student's question about how society can help underprivileged children who have lost a parent or live in single-parent families. She began by saying: "take an interest in the child." Children in similar circumstances need to be surrounded by people who not only care about them, but who can help them see beyond their immediate reality. For children who grow up in poverty, and whose parents don't have the time or the resources to show or teach the kids what's out there, it is absolutely necessary to find a family member, friend, or mentor who can help them see beyond what they're used to. So, for us who have been privileged with a formal education, it's our responsibility to "plant the seed" in these children by exposing them to educational experiences (taking them to the theatre, a National Park, to visit colleges, etc.) that will allow them to build their own dreams. "Try to do the unexpected"
This comment came as an answer to a student who ask how she, as a Latina woman, could improve the chances of succeeding in the future. After half-jokingly saying, "You need to work twice as hard," Justice Sotomayor reminded the audience that because Latino/as have been typecast in this society, we must work very hard to break those stereotypes. This is why "doing the unexpected"--claiming a space in professions where Latinos are either absent or poorly represented--is a key not only to personal success, but that of the Latino/a community as a whole. When asked why she decided to write My Beloved World, she said her "audience was everyone, but especially kids." Recognizing the need of Latino/a and other minority children to find role models and see themselves reflected in literature in order to dream big, she simply stated: "I wanted to touch their hearts; I wanted to reach them." 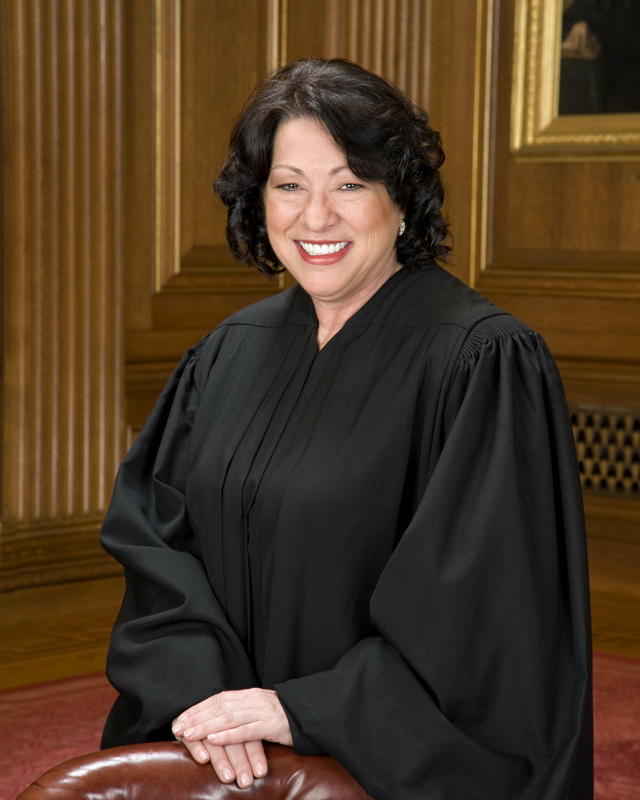 Justice Sotomayor's example as a Latina woman who has succeeded in immeasurable ways despite her difficult childhood should be an inspiration to all, especially our youth.